Who Really Wants To Leave The House on Black Friday? Not me...especially when every year you can read stories of people getting trampled, kicked, arrested, and potentially even getting killed. Now anyone that really knows me, knows that I LOVE getting a deal or using coupons, but when it comes to putting myself in potential danger by other human's that might be a bit too excited to save a few bucks here and there. Do you really want to fight with this many people for a cheap toaster or TV? It doesn't seem to be worth all the trouble. I mean sleeping in tents outside stores, lining up early, all that anticipation...really is it worth the hassle? Being soured on Black Friday after a few years of working it for Best Buy back in high school enabled me to enjoy the day staying inside and recovering from gorging myself with the treats and eats of Thanksgiving. Even these days with all of the deals being basically available online either on Thanksgiving or on Black Friday/Cyber Monday, it makes it easier for people to say inside and shop with their fingers rather than their feet, arms, elbows, and other appendages needed to shove others trying to get that last terribly crappy stereo. 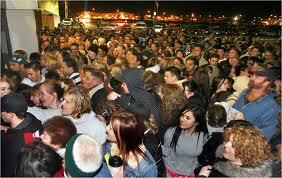 Black Friday is becoming as much of a Hallmark holiday as Sweetest Day has become. So who's with me in staying in the warmth and cozy of your place of residence and avoiding a potential trip to the hospital?